edddison plugs in directly to these software packages. Our intention is – Why invent new 3D software? Millions of users can’t be wrong, so we rely on proven, widely used 3D software, so you can navigate your 3D file within your well-known, favorite daily used software. edddison is not only soft- and hardware, but a unique platform, which combines standard 3D software with input devices in one system, thus allowing users to create impressive applications. The general workflow is as follows: First, prepare your 3D file (create), then configure it without programming skills (design), and for the presentation or meeting control it remotely with tablets and/or tangible objects (present). Why we decided to choose the following software. 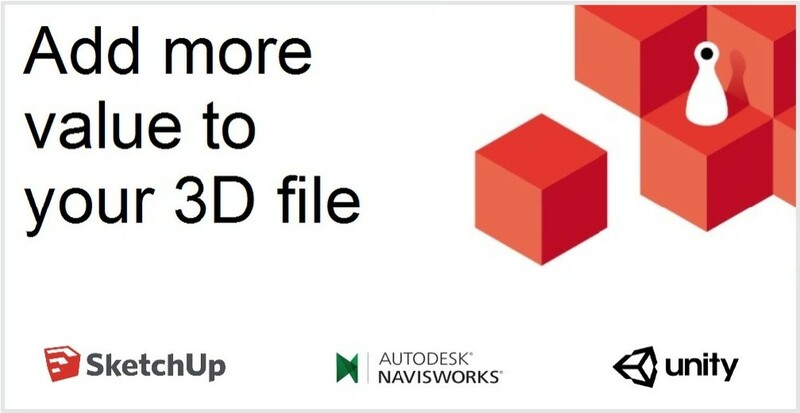 2-Autodesk Navisworks for BIM (building information modeling). Navisworks® project review software helps architecture, engineering, and construction professionals holistically review integrated models and data with stakeholders to gain better control over project outcomes. Integration, analysis, and communication tools help teams coordinate disciplines, resolve conflicts, and plan projects before construction or renovation begins. NW can handle huge file sizes but it is tricky to make a walkthrough with mouse. 3-SketchUp is the easiest way to draw in 3D. For early sketches and design ideas. Millions of SketchUp designers rely on the software. Now, with just a few steps, they can present their files interactively and involve clients, colleagues and managers in the presentation. Importing other CAD files into Unity. We wrote a blog “How to use my Revit, Max, Maya, Cinema4D and other 3D files with edddison”. For the future: In general, edddison is open for third party products and can work with every 3D software. Plug-ins for more widely used software packages will be available in future. Please let us know which ones you prefer.